Young Cassius Clay won a gold medal as a light heavyweight at the 1960 Olympics in Rome. Later, upon returning to the United States, Clay was refused service at a small diner because of his race. Clay walked out of the diner and threw his gold medal (which he wore all the time) off a bridge and into the Ohio River. He claimed he didn’t want to wear a medal in a country where he couldn’t be served. Why is this important? There have been so few trophies or awards preserved from Young Cassius Clay that anything that ever comes on the market, Collectors rally at the chance to own a piece of this history. With Muhammad Ali fight worn trunks selling over $800,000 in 2014, up $700,000 from its previous sale the year before, it is no wonder why the richest of the rich are raking up these assets without the blink of an eye. Anything that was worn by Ali and especially awards given to Ali have gone up 70-100%. There are some athletes that mean more than their career. They are national heroes, representing their era like Babe Ruth, Mickey Mantle, Michael Jordan, and naturally, Ali as the “Greatest”. Very few trophies or awards exist from Cassius Clay’s early days. These prime years of Ali’s career, without question, are vital to the collector. His 1957 Golden Glove award went for for $20,000 in 1997. What would this trophy sell for now? Today’s market this trophy would command over $100,000. A trophy of this caliber has not hit the auction market lately, not until this 1959 Cassius Clay Golden Gloves, Clay’s First National Overall Tournament Win at Chicago Stadium, a much more significant trophy in Ali AKA Clay’s Career. 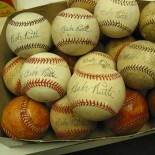 1967 Pittsburgh Pirates – Team-Signed ONL Giles Baseball Signed Twice by Roberto Clemente, Willie Stargell, Bill Mazeroski, Elroy Face, Hal Smith, Al McBean, Maury Wills etc. 1960 New York Yankees AL Championship Season Team-Signed OAL (Cronin) Baseball Sweetspot feat. Mickey Mantle & Elston Howard + Roger Maris, Casey Stengel, Yogi Berra, Whitey Ford etc. Fact 1: He never turns down an autograph request. Fact 2: He used to race the school bus. Fact 3: A stolen bicycle started his boxing career. Fact 4: He only wore Elvis’ robe once. Fact 5: He threw away his gold medal. Fact 6: He rode in the Tournament of Roses Parade. Fact 9: Ali helped give us Rocky. Fact 10: Ali has quite a show business resume. Need some help to appaise your collection for tax purposes, for estate planning, or just to see what your stuff is worth? Give us a call today and let us tell you what its worth! 888-308-9714 Ask For Kieta. Our objective is to acquire high valued estates, celebrity collections, sports memorabilia, superstar athlete collections which will be benefiting their specific charities as well as their own estates or the personalities themselves. Our acquisitions team will work closely with charities, fundraising committees or athletes that will be coming through our Las Vegas office, obtaining collectibles for their events, or selling their existing estates and memorabilia. That means this sourcing of extraordinary superstars is going to be available to you the buyer and seller. Yes, this is what you will enjoy when you BidAmi Auctions! This entry was posted on March 6, 2014 by Memorabilia.Expert BidAMI in Authentication Tips and tagged autographed memorabilia, best boxing memorabilia, boxing memorabilia, cassius clay, muhammad ali.